J. Crew is one of my all time favorite brands. They continue to inspire me with every collection! Their Fall 2011 collection is amazing. I love wearing color in the fall and their color choices are so bold and bright. Their new lookbook incorporates brights in such a quirky yet sophisticated way. Love! I love how brights are incorporated into this fall collection! Oh, J. Crew. Be still, my heart. I was just looking at these yesterday swooning!! I love the extraordinary usage of color in J. Crew's latest collection, and that feline print clutch! Wow. Love all the colors for fall, too! Totally can see why this brand is a favorite of yours! So happy to see that color blocking will still be 'the thing' come fall! There is so much here that I love - now I am aching for fall to arrive!! LOVE bright colors...and ecstatic J. Crew is rolling them over into the fall! They're one of my favorite brands as well the new looks they put out are incredible. Can't wait to get my hands on some of it. I love the bright thistle color...I hope they have some fuller skirts though! Wow! J Crew got revamped again. I love it all! 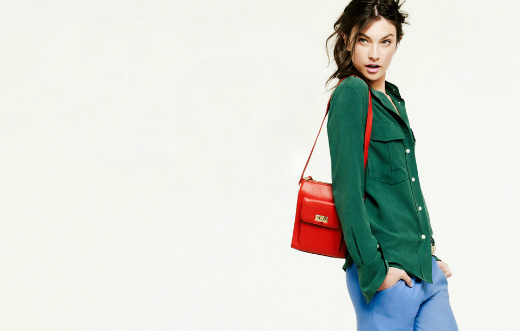 I just did a post on the new J Crew lookbook ---- it's to die for! I am a huge fan of their simple, classic style. They always know how to bring something new and fresh to the table whether it be with fantastic detailing or fun colours. J Crew is so wonderful! I feel like I could wear anything and everything they have. J.Crew is the single most important reason I love FALL!!! I love their fall lines!! I have a pair of burgandy minni pants (Seen in Lucky) on my wish wist already!!! ahhh love the green silk shirt! I definitely love the shoes and leopard bags. J Crew channeling Gucci? Hey, it's much better for our wallets! Love the fuschia pants! Yes please to bright colored pants and skirts! LOVE it. I am so in love with their new fall collection. LOVE that last look. Charcoal blazer and leopard purse! Must haves for fall! I love all the colors and the vintage silhouettes! Gorgeous collection! You're right, JCrew is consistently awesome. i want all of these! thanks for sharing! omg... J.crew... just too good! I just bought a new bold bright purple skirt...so now I feel great about wearing it for fall! J crew lookbook does it again! Always so damn perfect! I'm lusting after that brick red coat and the green sweater. Love love love! Bought an electric blue blazer from Zara today. I love colour so much! I didn't always love J.Crew, but ever since Jenna Lyons came into the picture the brand has completely turned around for me. I love all the brights and high end accessories like the clutch in the second shot. Lovely! I have a love/hate relationship with J.Crew. I LOVE them because every single piece of their collection is absolutely amazing and I HATE them because every single piece is absolutely amazing and I want it ALL. I luuurve J Crew and I wish it was available in Europe. Or that they at least made it available through a European webshop. Ohhh, I loooove those pinky, magenta pants! I want those. But I have a pair of yellow cafe capris from JCrew and everytime I wear them I get a lot of stares. New Yorkers need to get with the program and get some COLOR! I def stand out on the subway, lol. My closet looks like a jcrew dressing room. I am completely obsessed!! !